If you want to generate leads, grow an audience, and build a successful online business, then it's time to get moving with a CONTENT MARKETING STRATEGY! This will prove to be the most critical component of your entire online marketing strategy. Period. It’s simply not an option to ignore. Because content is the back-bone of your online business and is used to attract prospects, turn them into leads, and get them to buy your products, services, or even join your opportunity. It's your fastest and most certain way to build authority, create engagement with your audience, and boost your conversions. Content marketing lets you show your potential customers who you are, what you're all about, and how you can help them solve their problems. This allows you to build the trust you must have to get your prospects to want to do business with YOU in the first place. It’s superior to the traditional advertising we're used to seeing because content lets you build instant and lasting rapport with your customers on a deeper personal level. Also, consider the length that users are going to ignore and block tradition web advertising. 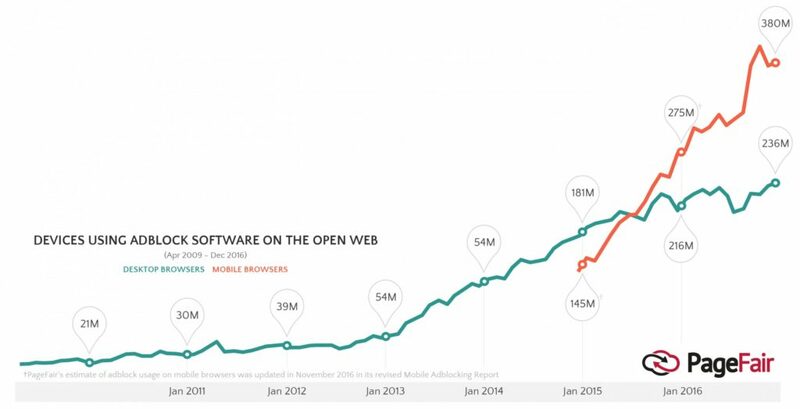 The statistics on ad blockers are rather sobering. Over 11% of the global internet population is blocking ads on the web, and that number is growing rapidly. Putting great content first will help create a bond between you and your customer, often times well before you even know who they are. Which essentially means hands-free and automated marketing for your business and your brand. Yet, they'll feel like they know you, like you, and trust you...which is KEY to your success! But before we get any further on all the great things content marketing will make happen, let's get the biggest question out of the way first. 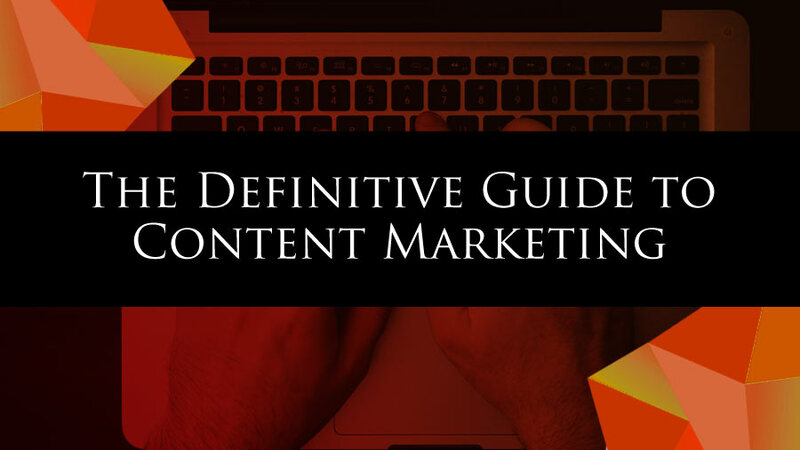 This definitive guide to content marketing comes with a free companion pack download. You can download this now so you have the materials available to you while you are reading. 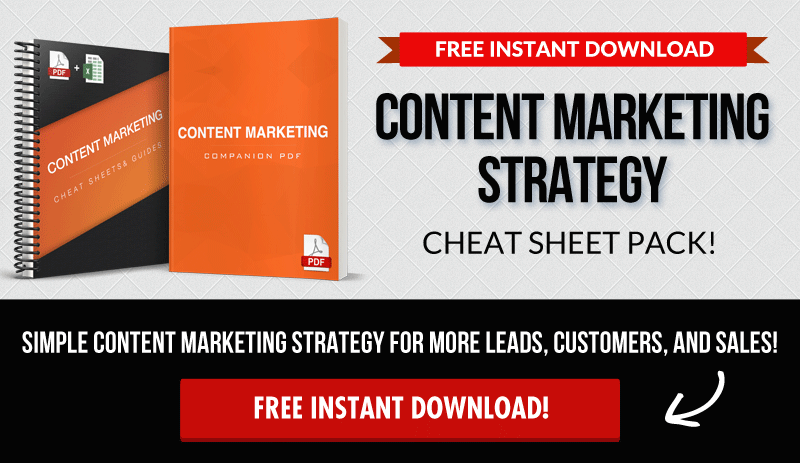 As part of this download, there is spreadsheet included that will help you plan and create your very own content marketing strategy specific for you. In the video below, you will see a walkthrough on how to use the spreadsheet, as well as it's importance when it comes to congruency and keeping you on track. Enjoy! In other words, content marketing basically means any marketing you do that involves creating and sharing value.This can include your blog, your social media posts, your videos, landing pages, your email marketing campaigns, sales pages, etc. In the online world (which we're going to focus on), this can include your blog, your social media posts, your videos, landing pages, your email marketing campaigns, sales pages, etc. The purpose, of course, is to attract attention to you and your brand. To let your potential prospects know you're there, and that you have what they're looking for as a solution to their most pressing problems. Why Is Content Marketing Such a Vital Part of Your Online Business? In essence... with an online business... your content IS your business! Let's look at this interesting statistic from SPRK-D.
What that statistic really tells us is that your potential leads want to know the “person” behind the business. They want to know YOU. Your philosophy. Your purpose. And they can learn a ton from your content, as opposed to an ad that you might slap up. It's critical to keep in mind (and too many people forget this), that underneath it all, your prospects want to know what you can do for them. So the question is, how can you legitimately help your target market solve their most pressing problems at the moment? Your potential leads are a lot more likely to do business with you if you can provide content which builds tremendous trust, and answers that question. The More Content You Post, The More Likely You Are To Get Found by Your Best Prospects! Posting regular content helps you increase your chances that your prospects will find you. Google loves fresh, timely, and relevant content. When you post valuable content regularly, you get rewarded by being indexed by Google. Please be aware though - MORE is not always BETTER - The content you put out there MUST be valuable, it MUST be congruent, and it MUST be useful to your target market! This is a 'you scratch my back, I'll scratch yours' type of symbiotic relationship with Google, because without constant relevant content from people like YOU... they too suffer! If you get ranked and found by prospects on search engines, your organic traffic increases, and in the numbers game of online marketing...your chances of getting a new lead, making a sale, or recruiting a new rep in your biz skyrockets. Bottom Line – Consistently Generating Fresh Valuable Content Allows You To Continually Grow Your Audience. It will help you attract new website visitors since you’ll always have new value to share. By sharing free value, you’ll also be able to engage with your audience on a deeper level. Which means lead generation becomes much easier. You’ll be able to turn your audience into warm leads, and we all know that warm leads are a lot easier to turn into customers. But, that’s not all. Content marketing helps you up-sell to your existing customers. Even if they’ve already purchased something from you before. By keeping them engaged, you’ll have the opportunity to sell an additional product or service to them at a later time. You can essentially turn your customers into fans and advocates when you give them a reason to keep coming back. Creating valuable content is the first step in your content marketing strategy, and by now you might be wondering what type of content you could create. As mentioned earlier, content can be produced as blog posts, videos, social media posts, emails etc. All of these work. But what you should do, especially if you're just starting, is pick your favorite type of content and stick to that. To break this down a little further, there are essentially 3 DIFFERENT STYLES OF CONTENT. Personal Connection Style Content – Show Them Who You Are! 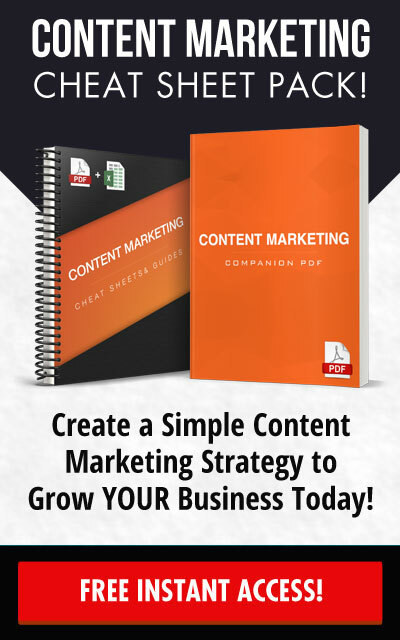 Download 4 PDF Templates & Step-by-Step Checklists to Create a Simple Content Marketing Strategy to Grow Your Business Today! Let's dive into these a bit deeper. Style #1: Personal Connection Style Content - Show Them Who You Are! The purpose of this style is to create a personal connection with your audience. For instance, this could mean creating a personal blog post about you. Tell your audience YOUR story. How did you get started in your business? What are some struggles you had to overcome? This lets them relate to you on a deeply human level. Underneath it all, your prospects want to know what you can do for them. It tells them they're not alone on this journey, and you understand their plight. You could also take a snap photo of your “day in the life” and share it on social media. People love to see what’s going on behind the scenes. These types of posts can generate a ton of engagement. If you like to travel, share your photos from your trips. Let them see what your life looks like outside of work. Personal connection content will help you build a bond with your prospects. This type of content has been around forever, and it's stood the test of time for good reason. There are always people looking to learn something new. Something to help them break through. How-to videos and articles are popular because they help solve a problem directly by providing the solution on the spot. So find out what your audience needs help with, and create as many how-to posts as possible. Promotional posts are pretty straightforward. While you should never ONLY create promotional content, don't be afraid to weave them in with all your other content in order to make sales. These posts could be announcements of a new product or service, special offers, events, or updates to existing products. Your content could (and should) also educate your audience on how to use your products, so they have a better understanding of why they need them. You can literally use any of the above examples to generate unlimited ideas for fresh, value-packed content for your audience. The key to these working is that you first provide value, before asking for the sale! Before you begin generating content, you must understand that the first fundamental rule of marketing is delivering the Right Message to the Right Market. This is absolutely key. If you don’t get this right, it doesn’t matter how great your copy or your product is. None of it will matter. But when you get it right, it's magical and profitable. This is the vital first step that cannot be skipped. Grab a piece of paper or open a new WORD document. It's time to identify EXACTLY who your target market is. Who are they? : Women? Men? How old are they? Do they work? Are they stay at home moms? Burnt-out dads? Executives? Blue collar workers? Brainstorm all the problems and challenges that they’re experiencing right now that you could potentially help them solve. Sure, you probably won’t be able to solve them all, but for the purpose of this exercise, just write them all down. Just keep listing as many as you possibly can. Put yourself in their shoes. Write down the burning questions they may be asking. What's keeping them up at night, staring at the ceiling, so stressed they can't fall asleep? What makes them zone out about when they should be working or spending time with loved ones? What are they struggling within their business? Do they need more leads? More sales? Are they afraid to get on video? What's holding them back? The more problems and challenges you can identify, the more money you can potentially make. Social Media - Use Facebook and Twitter. Look at hashtags that may be associated with your market. What are they talking about? What words are they using? What questions are they using? Are there any Facebook groups based around your target market that you can join? Reddit - Reddit is an online community that provides 'sub-reddits' or small communities of specific interests. There is a sub-reddit for pretty much every topic. Find your relevant community on there and join the discussion! AnswerThePublic.com - This is an awesome resource that provides you with questions that your target market is asking in Google and Bing. This is such a great service that, while it's free now, it probably won't be soon. It even allows you to export the information they give you in a very nice visual data sheet! These are just some examples, but the bottom line is: Find out where your target market hangs out online, and join the conversation! Some more great tools that can help you identify your target market AND their questions, concerns, struggles, etc. can be found here. This step is the MANDATORY first part of your research. Especially if you’re not already seeing the results in your business that you want to see, so don’t skip this part. It's time for a little espionage activity. This is the fun part. You'll want to find those who are already creating the results YOU want to create. Success leaves clues. Don’t worry that it's been done before. The beauty of this is that you don’t need to re-invent the wheel. You only need a small piece of the pie to make a really good income. There’s plenty for everyone. Who's ranking in Google? Who's getting a lot of engagement? Who has active Facebook pages with tons of followers and engagement? Research what they’re writing about and which of their articles are getting the most engagement. Pay attention to what stands out. In order to provide the content that people want, you need to know what it is they want. What are the looking for? What are they sharing? It can take hours scanning all the various social sites to find out what people are talking about, what their concerns and needs are and what they are sharing. Being able to input certain search criteria and keywords, analyzing content and finding out what is already working in your area can be priceless to a marketer. 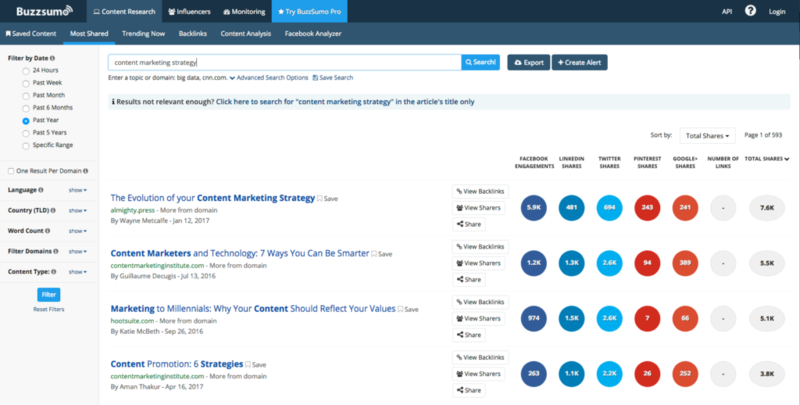 A BuzzSumo search will find most shared content across all the main social networks. These services will let you see competitive data on different websites in any industry. You'll get to see all the top organic keywords that generate traffic to your competitors website. While these tools are rather pricey, the data and information you can get from them can be invaluable. 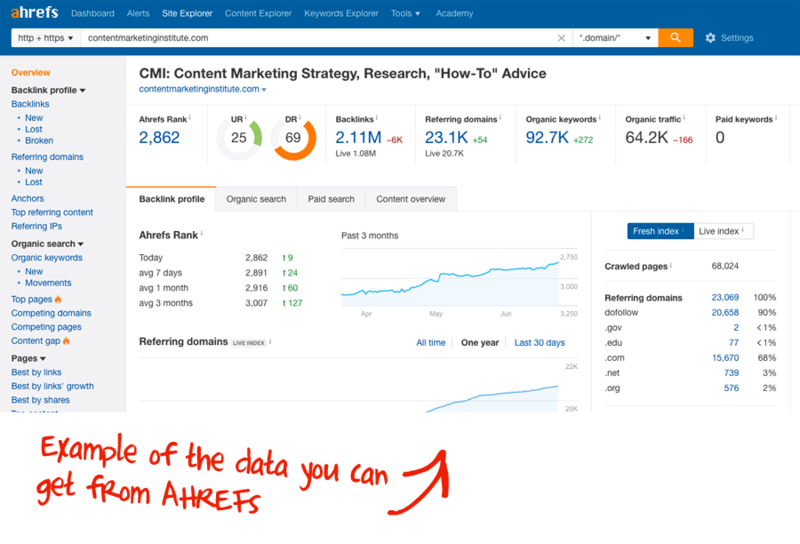 If you plan on taking your content marketing strategy to the next level, you may want to look at one of these competitor analysis tools. You can't be everything to everyone if you want to be seen as the expert that people are going to look to. Now that you know who your target market is, you can start to create your own content ideas. You can spin your own variation on the topics you’ve found so far that's getting high-engagement for your competition. Once you understand the marketplace, and have a clear idea of what content to create, you’ve got to narrow down your branding and focus on a few of the most important struggles that your audience is dealing with. Stick to 3-8 main categories of topics you’re going to cover. Don’t create content around everything under the sun. Target your audience's specific wants and needs. When you make all of the above clear, you’ll quickly be seen as an expert in your field. So when someone comes to your site and sees that you have several different articles all revolving around Instagram, mindset and sales, you’ll look like you know your stuff because you have plenty to say about it. We've covered what content marketing is and why it's important (there should be no doubt in your mind at this point how important a content marketing strategy is), we've talked about different types of content you should be creating, and how to put a content marketing plan in action. I want to go over some tips, tricks and strategies that have made a drastic impact on my content marketing strategy personally. You’ve got to make sure your content is congruent and always aligned to your specific niche. This way your prospects understand that YOU are the person that can absolutely help. They'll see you as a leader, and be much more likely to become an interested lead, and therefore buy your products and/or join your opportunity! If you want to go the extra step, create a blog content planner to help you keep organized. This will also ensure you always have new & fresh content coming out regularly, to keep your audience coming back. Create a spreadsheet to keep track of your posts. In this spreadsheet, include the types of posts you’ll be creating and the media you’re going to use to post them on. How To Make Sure You're Creating Highly-Valuable Content for Your Target Market! When it comes to creating content, it’s important to realize that LESS can be MORE. Less high quality content is superior to more low quality content any day of the week! According to Worldometers, there are over 3 million blog posts published daily! And this is just the ones published on WordPress.com. That number is growing every single day. Expanded Ramblings says that if we add video, there are over 300 hours of video uploaded to YouTube ever single minute! That’s a lot of content being shared every single day, but it doesn’t mean that it’s all good content. So your high-quality content will be noticed over all the noise. 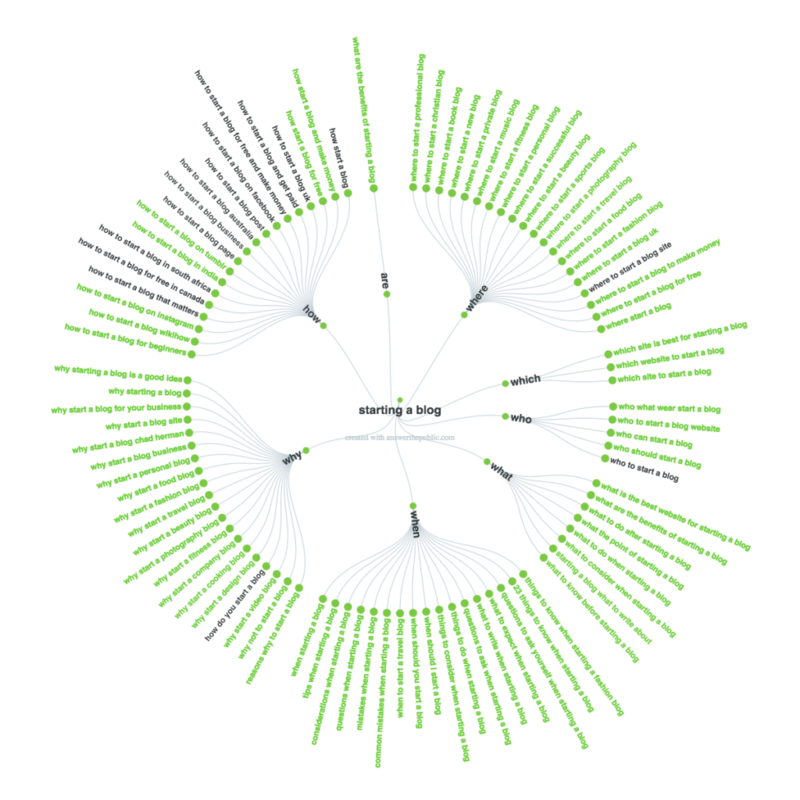 How the SEO Game Has Changed Over the Years. In previous years you could get away with just uploading content and adding a few links and keywords to your content. That worked until about 2012. However, that’s changed drastically in the recent years. Today’s SEO is all about engagement. Google is now looking for high-quality relevant authoritative content that people react to. They’re looking at the length of content, how much time is spent on that content, how (if at all) are readers engaging, is the content being updated on a regular basis, and are people linking to your content. This last part is arguably the most important. Backlinks are considered the number 1 factor in getting your content ranked on Google. It's basically a vote of confidence if Google sees other websites linking to your content. It's telling them that those sites think your content is in someway helpful to their audience! This means click-through rates, scroll depth, time spent on web pages, video views, backlinks, bounce rates, comments on your posts and social shares all counts to Google now. This is exactly why you need to focus on QUALITY OVER QUANTITY. In fact, if you’re just getting started... the first piece of marketing content you might consider creating is a Pillar Blog Post. You've likely heard that “content is king”. But it seems that there's a new king that's ruling the content game, and that's Pillar Content, and it needs to be a part of your content marketing strategy. A Pillar Content post is an incredibly effective way of standing out as a credible expert in your niche. This is the type of post that will leave an impression of leadership for you reader. The post or series is updated, and referred to repeatedly – which continuously adds to it's value. Your pillar content can become the go-to article for that chosen topic in your niche. This content will strengthen your brand promise, establish trust and credibility, and pre-sell your prospects on premium content. Pulls in long-term ongoing traffic. Helps establish YOU as the expert, builds authority, and will ignite powerful ENGAGEMENT! You can look at some great examples of pillar content here http://www.robbierichards.com/social/how-to-promote-your-blog-post/ or here http://onlineprofitplaybook.com/how-to-promote-your-blog/. Sure, a pillar post will take you some time to create. But it will serve you for a long time and keep new visitors coming to your website regularly. Which means a continuous flow of FRESH LEADS! Once you create this post, you should add to it ever year, creating more backlinks and driving more traffic. This will help you create more engagement as well as get more social signals. You can also use these types of posts as featured guides on your website. The final step is for you to create content upgrades. The ultimate goal of your content is to attract attention so that you can get leads and sales from your prospects. Pillar Articles are insanely effective for this purpose. A content upgrade is a valuable piece of content that will compliment, or enhance the original article or blog post the visitor came to read in the first place. You can give this complimentary upgraded content away as a lead magnet or special offer in exchange for your reader's email address. (In other words, they must subscribe to your list...and become a lead...in order to receive this upgraded content. What more can you offer your reader to help them get the most out of your content? What other related problems might they have? What could you give them to make the solution easier, simpler or faster? For example, in our pillar post about starting a blog called "The Definitive Guide to Starting a Blog (And Making Sure it’s Successful! 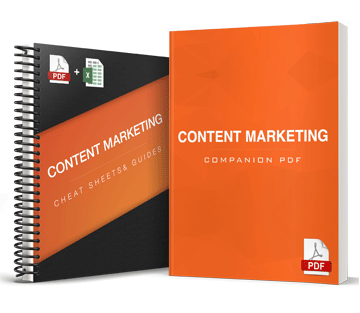 )", you'll notice that, because the post is over 10,000 words, we've offered an option for the reader to download the 32 page PDF version so they can dive in to the content whenever they have time. It doesn't get much more congruent than that. Your upgraded content MUST be a congruent, relevant LEAD MAGNET that’s specific to your pillar content blog post topic. It should be the next step in your prospect's journey. For instance: If your Pillar Content is teaching readers how to get leads from Instagram, your upgraded content (or lead magnet) could be something like: “How Take Your Leads from Interested, to Foaming At the Mouth and Ready to Buy/Join.” Or perhaps it's a checklist or cheat sheet they can print out and keep on their desks? The best part is that it’s even better than a regular lead magnet because it generates much higher conversion rates. You KNOW your reader is interested in it because they are already indulging in content that is related! It's like adding grease to your funnel, sliding your prospects through almost effortlessly. If you're building an online business, this is critical because it will help you increase leads without increasing traffic to your website. By now you're probably anxious to get started with your own content marketing strategy and start growing your business exponentially. It's important that you realize that you don’t need to be making six figures to start to bring value to the marketplace. Even if you’re a beginner, you should do all of the above to quickly establish your authority in your industry. When you take the action steps outlined in this article and focus on pillar blog posts, you’ll immediately gain authority because people will find value in what you provide. So start now to be seen as an expert faster. ANYONE can go through & EXECUTE this Content Marketing Strategy and GET RESULTS… AWESOME!